Lily is a smiley little girl who is 4 years old! Lily was born with Down’s Syndrome. Since she is not receiving the proper therapies, Lily is delayed compared to her peers. She can respond to familiar people speaking to her and she gets along well with other children! She is delayed on her language abilities but her file indicates that her fine motor skills are on target. GWCA is currently asking for an update on Lily! Contact one of our matching specialists today if you’d like to look at her medical file! Meet Stevie! 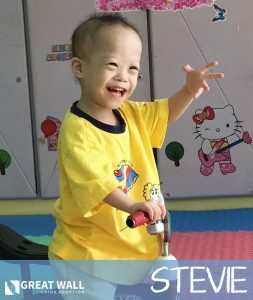 Stevie is a precious 3 year old boy who will be turning 4 this March. He has been diagnosed with Down Syndrome. He is a sweet, social little guy who loves his caregivers. He is able to walk while holding on to handrails and can eat by himself. He loves to play with toys and loves the toy piano in particular! He likes to have conversations with others and is described as being very outgoing and active. If you’d like to learn more about Stevie, please reach out to Great Wall! April is a lovely girl from China that turned 13 years old this past September. April’s file is brand new from one of GWCA’s Orphanage Partnerships. April will be aging out of the China Adoption System when she turns 14 years old this coming September, so we need to help find her a Forever Family soon. April has ametropia in both eyes but other than that she seems like a healthy, normal girl. April was abandoned right after she was born, but was raised by a family temporarily until she was 3 years old. April was then taken to the orphanage, but since she seemed to be doing so well, she was put in a foster family and has lived there since that time. Her foster family says that she is obedient and she is very helpful with doing chores around the house such as washing dishes and washing clothes. April has a quiet, introverted personality. April is in 8th grade at a regular school and she takes a full course load. Her favorite subjects are Chinese and English. She has two really good friends at school and they will sit on the playground and chat during recess. April has good language ability and speaks Mandarin. She can say some simple sentences in English. 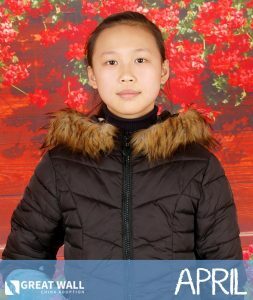 April was asked directly if she would like to be adopted by an American family and she said yes, she would like to be adopted. April is on our Great Wall China Specific Listing, so her file is only available through Great Wall at this time. 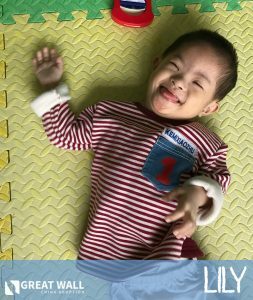 You can contact the China Home Finding Team at Great Wall if you would like to learn more about adopting April. We hope we are able to find April her Forever Family soon! Her caregivers describe her as an active, charming, and lovely girl. She is extremely affectionate and loves to be held and hugged by her nannies and nurses. She loves to play with toys and is able to grab on to the toys despite her limb differences. Overall, she is hitting all of her developmental milestones and is described as being very bright. She loves to mimic sounds of others and is even walking without assistance! She would thrive with continued care from a forever family. Please reach out to Great Wall if you would like to learn more about adopting little Laney! Beckett is a sweet little boy that just recently turned 2 years old. Beckett’s left ear formed a little bit differently but other than that he seems like a generally healthy kiddo. Beckett has normal mobility for a child his age as he can walk, trot and go up and down stairs by himself. He has good holding abilities and he likes to play with various toys in the activity room. He can understand the directors he receives from his caretakers and can follow simple instructions. Beckett’s language is delayed compared to some of his peers, but that makes sense given his left ear deformity. 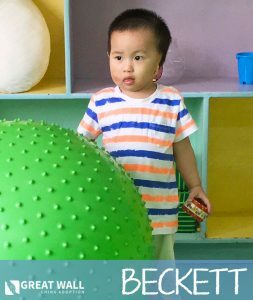 He can make sounds such as “aaa” and “yiyi yaya.” Beckett is a more introverted child and is happy playing alone, but he will also play with other children as well. He likes running back and forth in the playroom with the other children. He favorite toys are cars and a wooden rocking horse. You can contact the China Home Finding Team at Great Wall if you would like to learn more about adopting Beckett. We hope we are able to find Beckett his Forever Family soon! Meet Evan! 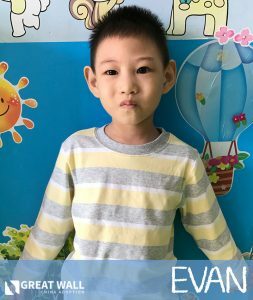 Evan is an adorable little guy who just turned 4 years old. He was born with Microcephaly. He has average gross motor skills but has some difficulty running. He has great understanding ability and can follow adult’s instructions. Evan can imitate adult’s actions and behaviors and his caretakers note that he has great observation skills. He has good memory and judgment and generally enjoys learning! Evan is warm and outgoing and his file states that all the nannies and kiddos in the institute enjoy him very much. 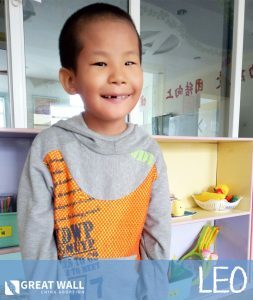 He gets along very well with other children and is fond of playing games with them! Contact one of our matching specialists if you’d like to review his file! Melanie is a smiley kiddo who is about to turn 3 years old! She was born with Apert Syndrome and cleft palate. Due to her Apert Syndrome, she has some limb differences of her hands and feet. She was a little over a year old when her file was prepared so we are working on getting some updated information on her. 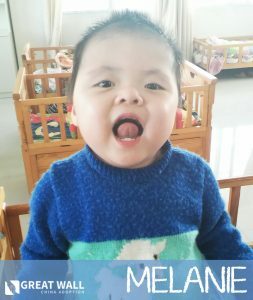 At the time, Melanie could stand while holding onto items for support and her file mentioned that she was growing healthily and happily! She was crawling well, could walk with some assistance of handrails and could respond to other’s directions! She was described as being able to get along very well with her peers and fond of listening to music. Contact one of our matching specialists if you’d like to look at Melanie’s file!